"I'm enjoying a day off in beautiful Atlanta, Georgia," says Alter Bridge and Creed guitarist Mark Tremonti. "A fan gave me an iRig for my iPhone, so I'm having a great time messing around with it. I'm checking out all these different amp sounds and practicing the guitar through my phone. It's tremendous!" When asked how a 'day off' consisted of doing what he does for a living - playing the guitar - Tremonti laughed and said, "Hey man, playing the guitar is a day off for me! It's what I love to do. Everything else about the business and stuff, that's what gets in the way. But if I can just sit here and practice, that's a perfect way to unwind." And a day off is about all Tremonti is bound to get for the foreseeable future: The guitarist has recently kicked off another round of touring with Alter Bridge (which also includes singer-guitarist Myles Kennedy, bassist Brian Marshall and drummer Scott Phillips). In addition, he's recording his first-ever solo album and is starting to put together plans for Creed's next record. And if that weren't enough, his company, Fret12 Productions, has just released the third installment of The Sound And The Story instructional-documentary guitar DVD series, starring expert guitarist and educator Troy Stetina. It's a jam-packed, three-hour affair, featuring a wealth of educational content (control and articulation, reducing playing tension, building engaging riffs, shred picking secrets, metronome techniques and more), behind-the-scene studio segments and an up-close look at Stetina's board setup. Tremonti, Michael Angelo Batio, Eric Friedman and Bill Peck also turn up to share their unique guitar tips. MusicRadar recently sat down with Tremonti to discuss his myriad projects. We also seized on the opportunity to pick the guitarist's brain about that triumph of triumphs - his and Kennedy's decisive win in Guitarist magazine's Greatest Guitar Solo Of All Time for their blistering work on the Alter Bridge song Blackbird. More touring with Alter Bridge. You guys don't believe in vacations, do you? "[laughs] No, not really. We're just getting started with another leg of touring. We're finishing up in the States in a few weeks, and then we'll be heading to Europe to do the festivals. We'll be out on the road until January of next year. We're going after it. AB III came out last September, so we're looking at being out for a good year and a half. Europe, then back to the States, then back to Europe, and then there's the possibility of us hitting South America and Australia." That's quite a schedule. And in the midst of everything, you're doing a solo record. "Trying to. [laughs] I'll get it done somehow." 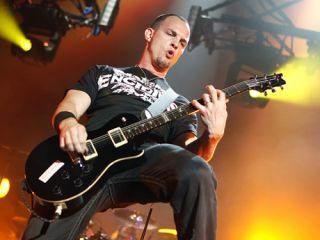 What can we expect from a Mark Tremonti solo record? "Well, that's hard to say right now. But I am pretty excited about it. I knew I'd have three months off from Alter Bridge because Myles would be out touring with Slash, and since I had all of these ideas that didn't make AB III or Blackbird or any other records, I figured I'd try to give them a home. So I went back, picked out all my favorite things and put 'em together. I'm kind of getting all of my speed-metal roots out on this record." A Mark Tremonti speed metal record - I like it. "Yeah. You're definitely going to hear an old-school influence, but I won't be sacrificing melodies. It'll be a good balance." How far along are you into the record? "See, I'm writing songs all the time. I've got so many ideas that there's just no way to get them all out. Releasing an album every couple of years, there's always a bunch of things that never make the cut. They're either too off the wall for Alter Bridge or Creed. But I don't want to see them get wasted, you know? And I'll be writing for the next two years for what will ultimately be the next Alter Bridge record. "For the solo album, I'm working with Eric Friedman and Garrett Whitlock at my house. I think we've got 14 songs happening right now. We've already recorded the drums. I laid down rhythm guitars on half the tracks, and when I went on tour, Eric stayed behind and did his rhythm guitar parts. We'll tackle the bass parts together, although Eric's already done some tracks. It's been a lot of fun. When it comes to touring, we'll see what happens. We'll probably have to hire a touring bassist, and Eric will play guitar with me." "Yeah! I'm singing. You know, I've been a songwriter for as long as I've been a guitarist, and singing just comes with the territory. I still don't know how great a voice I have [laughs], but over time I've done it enough to the point where I got my nerve to really go for it. Plus, when you want to do a solo thing in-between your other bands, it's just quicker to do it yourself." Are you going to be singing in a classic speed-metal vocal style? "No! [laughs] It won't be speed-metal vocals by any stretch. Musically, the riffs might have that vibe for intros, but then the songs will develop in other ways. So they won't be 'speed-metal songs' per se. They'll be heavier than things I've done in the past, but I won't skimp on the melodies. "It's very interesting and exciting doing a solo record. Even though I'm taking it seriously, I'm really doing it for fun. I've got nothing to lose. Elvis Baskette, who produced the past few Alter Bridge records, is producing, and he's great to work with. The sounds are fabulous." When are you going to try to fit in a solo tour? "That I don't know. I'm still figuring out if I'll be able to do it. We'll have to see. I have to say, the thought of fronting a band has me a little nervous. Nothing's decided yet." You mentioned Eric Friedman, who is one of the artists you feature on your Fret12 DVDs. Tell me about him. "Eric's amazing. He's like the little brother I never had. [laughs] I met him when he was 15 at the NAMM Show, probably about 13 years ago. He was like a prodigy at the time - had a Fender endorsement, was on Steve Vai's record label. Such a super-talented guy. We hooked up, played guitar together, and I was totally blown away by him." Let's talk about what you're doing with Fret12. You have the new DVD with Troy Stetina. You're building quite a little empire with these DVDs. "It's actually my brother, Dan. He's a real whiz kid when it comes to online marketing and graphic design. He's been hired by a lot of major companies for what he does. One day, he asked me why I never did an instructional DVD, and so we did it. I knew what I should do, that it should be bigger and better, longer and more extensive than a lot of the other ones on the market. So we all created the company and I did The Sound And The Story. I knew exactly what I wanted to see and hear. It's been very successful. "To me, an instructional DVD should really get inside the head of the player - show you what he does and why he does it. Plus, it should give you accurate tab; everything should be top-notch. We get very intricate on these DVDs and leave no stone unturned. If somebody's going to pay good money for something, they shouldn't feel ripped off, you know? And I made sure to feature guest lessons by people like Bill Peck and Myles, Michael Angelo Batio…Troy. That led to me doing a DVD with Leslie West and now this new one with Troy." The Troy Stetina DVD is an amazing package, and Troy is an unbelievable player. What kinds of things has he taught you as a guitarist? "Oh God…where to even start? [laughs] Troy's a master at guitar theory, and he's a ridiculously good teacher. He's written so many terrific books, and I think he's sold something like a million instructional products. I get so much every time I sit down with him. I love to pick his brain. His technique is unreal. I'm really happy that I've had this chance to do this DVD with him." I also enjoyed the Leslie West DVD you did. When you watch Leslie play, what do you get from him? "Leslie's vibrato is…he elevates the technique to an art. The aggressiveness along with the sensitivity. He has such tone, but it all comes from his fingers. His touch is so unique. The guy could pick up any guitar and make it sing." Let's revisit something cool that happened recently, when Alter Bridge - you and Myles, to be precise - won Guitarist magazine's Greatest Guitar Solo Of All Time for Blackbird. "I think it probably boils down to our loyal fan base getting behind their favorite band. The best guitar solo of all time? I mean, guitar solos are so subjective anyway, I can't even imagine how we wound up on the list in the first place. We got lucky, you know? We have great fans. To see our names alongside David Gilmour and Eddie Van Halen - it's mind-blowing." Greatest Guitar Solo Of All Time winners Tremonti and Myles Kennedy. I'd love to hear your thoughts on some of the solos you beat out. Well, you already said Eddie Van Halen. Guns N' Roses - Sweet Child O' Mine. "Yeah, man. I remember being in school and seeing the video to Welcome To The Jungle and just being blown away by Slash and his whole approach to the guitar. Sweet Child O' Mine is one of those solos you never forget. Everybody knows it, loves it - it's iconic." The aforementioned David Gilmour on Pink Floyd's Comfortably Numb. "That would probably be my favorite solo right there. It's pure emotion. That's a man singing through his guitar. It's perfection." Then there's John Petrucci and his solo on Dream Theater's Hollow Years. "You know, I don't know that song. I'm very familiar with John and his playing. He's amazing. I love what he does in Liquid Tension Experiment, and that book he did called Wild Stringdom is fantastic. Unfortunately, I don't know that song, but everything I've heard in play in Dream Theater and elsewhere is brilliant." Led Zeppelin's Stairway To Heaven. I imagine you've heard that one. "Oh, a couple of times! [laughs] Jimmy Page…probably the best composer in rock 'n' roll. His parts, solos…it's all pure emotion. He played big and loose and classy. He's the man." Switching gears completely, what's the story with Creed? "Actually, we just had a meeting with our manager and tried to plot out a schedule. Ideally, we'd like to see if we can work it out where we can make a new album early next year so we can tour in the summer of 2112. We're all talking and trying to figure things out." Has the dust settled within the band? I remember speaking to you a few years ago when you told me, and I'm paraphrasing here, that there was 'no amount of money in the world' to make Creed reunite. [laughs] "Yeah, well, things change. The bottom line is, it wasn't amount money. You look back at the videos and remember touring the world and selling out all of these places… Six years have gone by. We've had kids, we've grown up, the wounds have all healed. I think we realized that we got the chance to do something that few bands have the chance to do. Getting back together worked out. Nobody brought up the past. We got in a room and got on with it." So, after Alter Bridge, it's going to be your solo record and then Creed? "Right. I don't know if I'll release a full solo album next January. I might start releasing songs and then put out a full package. Then I'll get with Creed and see what happens there." "Yeah. [laughs] I'm busy, but my bands are definitely my priorities. The solo record is just something for me, to record music and put some things out. I would never do anything to jeopardize the bands."